Like many families around the world, when it comes to holidays, we all have our traditions. Growing up for me, it was going out for Easter lunch with my mom’s side of the family and later that night dinner with my dad’s side. As we grew older it started to change to eating dinner at home with mom and dad then desert at my aunt’s house. Things change as the kids get older, but being with family is and always has been at the core of my family holidays. Being far away from my family, the holidays can sometimes be a little sad, so my husband and children pretty much let me cook what ever I want. I stick with my tradition of honey ham for Christmas and Easter and my roasted turkey for Thanksgiving. Nothing crazy simple and elegant. Well this year I decided to rock the boat. Crazy! Rack of Lamb! Yup, that’s right! 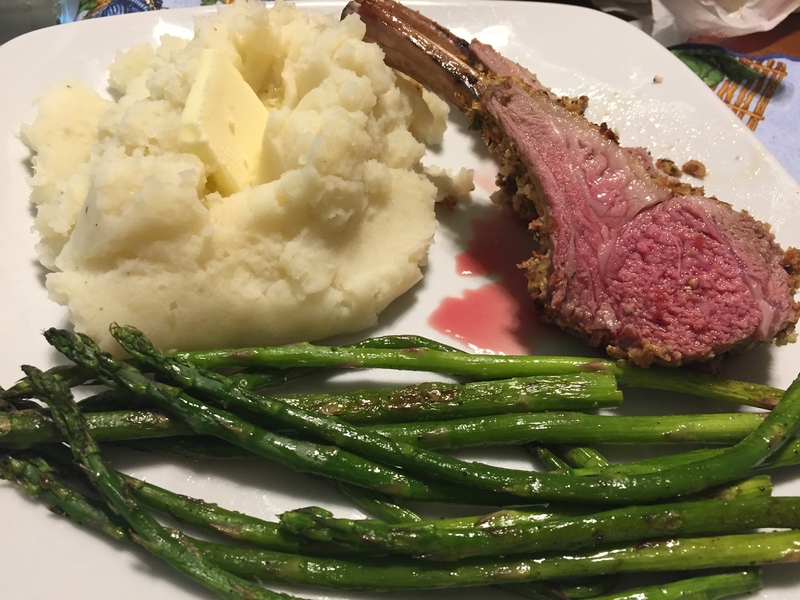 I tried cooking rack of lamb for Easter lunch with no back-up plan, so if it sucked ,we were eating peanut butter and jelly. I spent a week looking up recipes and watching videos to see how the pros do it. And let me tell you, that made it even worse. No two recipes were the same. Even the temperature and amount of time kept changing. How was I going to make this and have it come out perfect? Answer: do what I always do, combine recipes and hope for the best. My son, who is usually done eating after round one, ate three lamb chops before finishing his mashed potatoes. And my girls who would normally trim every ounce of fat off their meat, ate everything without hesitation. I would say it was a hit. The lamb turned out medium-rare and tender. It just melted in our mouths, and the fresh herbs made a world a difference. We may have found our new Easter tradition. In a large skillet heat oil over medium-high heat. In a medium bowl mix freshly chopped herbs and breadcrumbs. Set to the side. In a small bowl combine garlic and brown mustard. Using a pastry brush, brush all over both racks of lamb. 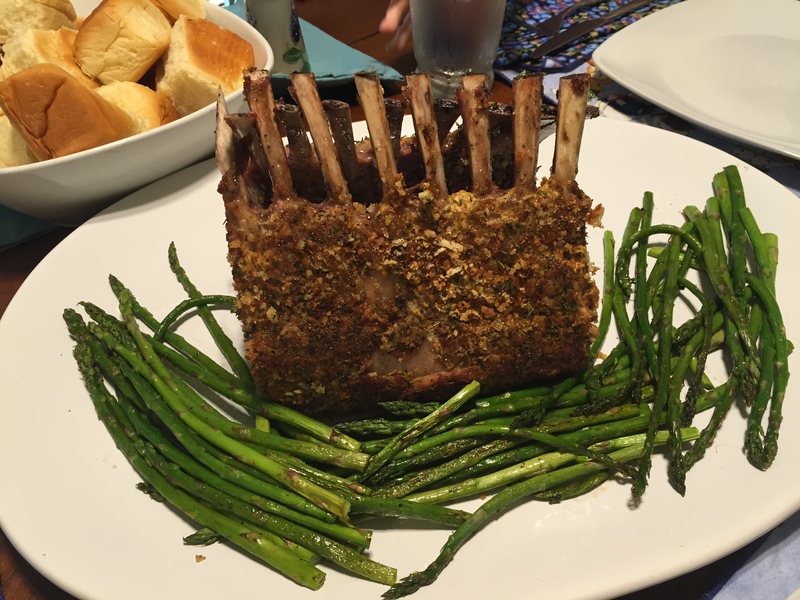 Once coated with the mustard sprinkle the breadcrumb-herb mixture over the entire rack of lamb. Repeat for second rack of lamb. Cover the ribs of the lamb with aluminum foil to help prevent burning. Make sure to place your oven rack so your lamb sits directly in the middle of the oven. Bake for 30 minutes, flipping half way through. This will get you a medium-rare lamb. You can adjust the time to get the doneness you want, just be careful not to over cook the lamb. Remove from oven and wrap with a loose foil tent. Let rest for 15 minutes. This will help get the juices back into the meat. To serve the lamb chops, cut in between the bones. This was the finished lamb before the kids started eating. Look at the gorgeous pink center. In a medium bowl comine flour, egg, sugar, honey, milk, baking powder, butter. Mix until everything is combined. Use a spring form plan. Spray the side and bottom of the pan. Pour cake batter into pan. 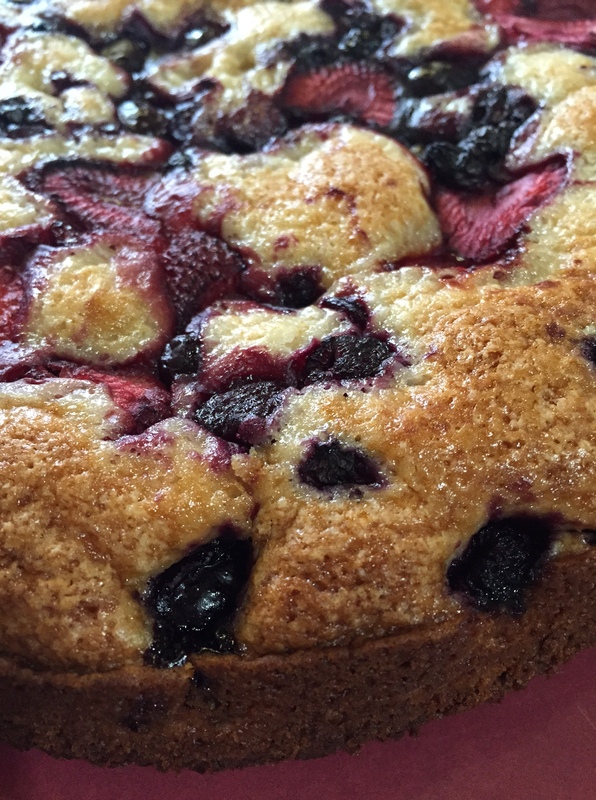 Sprinkle fresh or frozen fruit on top of the cake. Do not press the fruit down. Place in the oven on the middle rack. Bake at 375˚F for 30-45 minutes or until done. 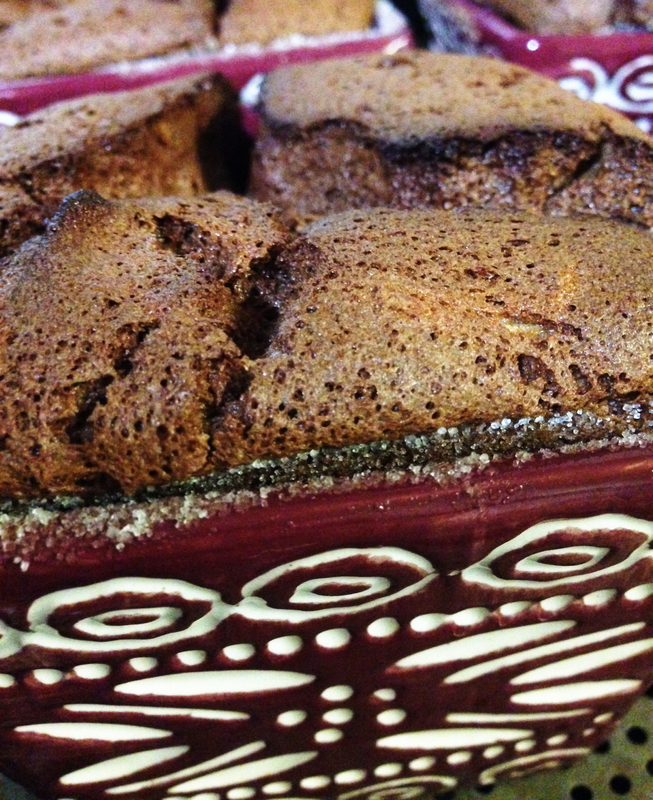 Once baked cool cake on wire rack. I made a triple berry souffle once to keep my kids happy during one of their school vacations last year and it didn’t seem hard. I had never made a chocolate one though. And given my love for chocolate seemed to me a little weird. I mean I LOVE chocolate. If there was a chocolate anonymous meetings I would be the spokes person. Preheat oven 350˚F degrees. Lightly butter or spray a 1 1/2-quart tall-sided baking dish or 4 10oz ramekins. Coat with sugar, tapping out excess. Set dish on a rimmed baking sheet. In a large glass bowl set over a pot of simmering water, combine chocolate, vanilla, and 1/4 cup water. Stir until chocolate is melted and mixture is smooth. Remove from heat and let cool to room temperature. Stir egg yolks into cooled chocolate mixture until well combined. Set souffle base aside. In a large bowl, using an electric mixer or a stand mixer, beat egg whites and lemon juice on medium-high until soft peaks form, about 2 minutes. Gradually add sugar and beat until stiff, glossy peaks form, about 5 minutes (do not over beat). With a rubber spatula, gently cut fold in half of the egg white mixture. Down through center and lift up some base from bottom of bowl. Turning bowl, steadily continue to cut down and lift up base until just combined. Add in the second half and repeat. Transfer mixture to dish or ramekins, taking care not to get batter on top edge of dish; smooth top. Bake souffle until puffed and set, 30 to 35 minutes. Do not open oven during first 25 minutes of baking. Serve immediately. Note: The souffle will start to loose it’s height as it starts to cool off. Serving Tip: You can dust the top with powder sugar or pop the center and fill it with either chocolate or vanilla sauce. Either way you can’t go wrong. Cacciatore means “hunter” in Italian. In cuisine, alla cacciatora refers to a meal prepared “hunter-style” with tomatoes, onions, herbs, and sometimes wine. 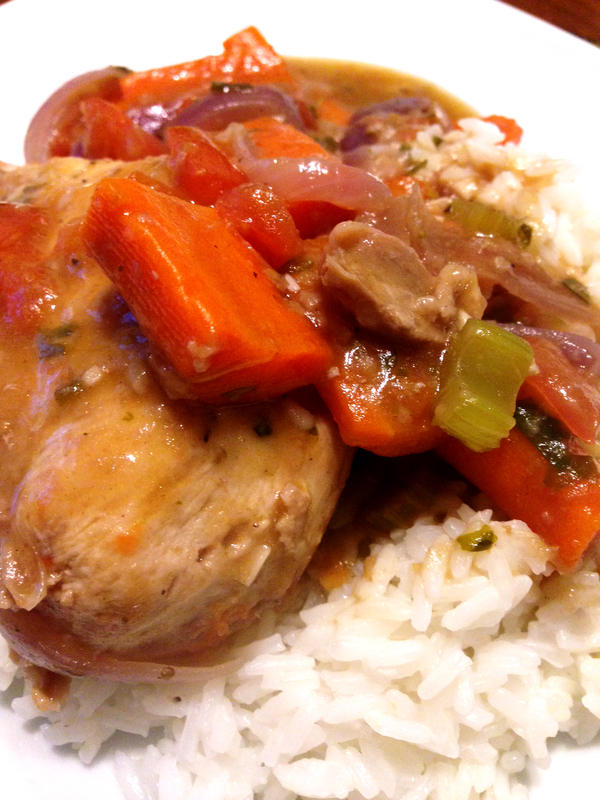 Cacciatore is popularly made with braised chicken (pollo alla cacciatora) or rabbit (coniglio alla cacciatora). Basically the hunters would use what they could gather in the woods, and use gamey meats like rabbit, venison, etc. I will have mine without Thumper and Bambi please. I am not really sure of how chicken was introduced, though one story is that if the hunter returned home empty handed his wife would go out back and kill a chicken and add it to the vegetable stew. Another story is that the chicken got into the hunter’s vegetables like carrots, onion, and celery. And when the hunter caught the chicken, he became the dinner for the hunter and his family. There are so many different variations of this dish based upon ingredients available in specific regions. For example, in southern Italy, cacciatore often includes red wine, while northern Italian chefs might use white wine. Some variations include bell peppers and mushrooms mixed in with the vegetables. I wish I had mushrooms on hand when I made this meal, the sauce would have gone great with the flavors of the mushrooms. 1/2 cup white or red wine, I used red wine. In a large heavy pan heat 2 tablespoons of oil. In a large bowl mix together flour, salt, pepper, and Italian seasoning. Once everything is combined coat chicken pieces on both sides. Place chicken in the hot oil and cook 5-6 minutes on both sides. Once chicken is done remove from pan. In the same pan that the chicken was cooked it add the onions, carrots, celery, and garlic. Cook until the onions are tender. Add the parsley and stir to combine. Slowly add the chicken stock to pan. Using a spatula deglaze the pan. Bring to a slow boil. Add in the 1/2 cup wine. Bring back to a boil. Boil on medium-high for 5 minutes. Return the chicken to the pan and continue to cook until the chicken is completely cooke all the way, about 30-40 minutes. We served ours over white rice. You can serve it over pasta, rice or potatoes. I hope that you enjoyed this little trip to Italy as much as we did. What country will our taste buds take us to next time? 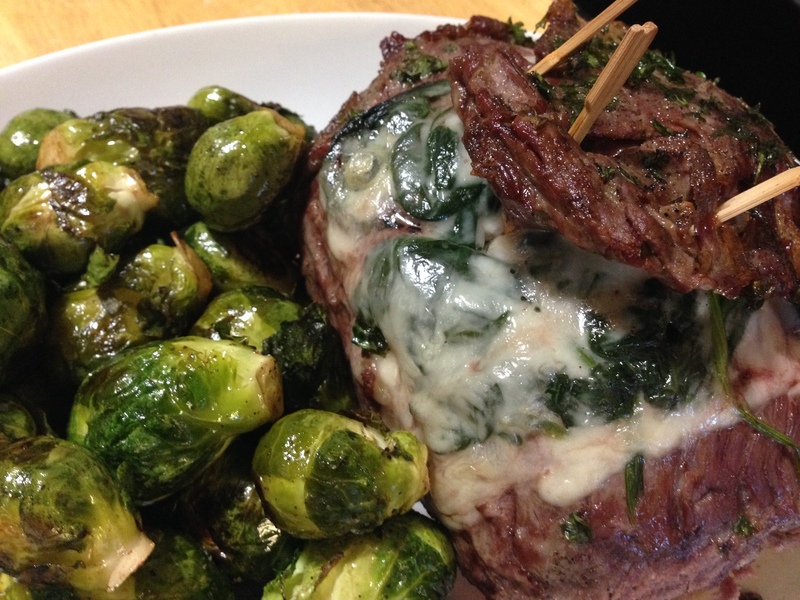 During one of my late night scrolling I saw this recipe with a flank steak and feta cheese. I hate feta cheese, to me it smells like stinky feet. I am not eating anything that smells like stinky feet. And flank steak can be expensive when trying to feed a family of five. So I changed something’s and I think it looks even better then the original. I swapped the flank steak for a cheaper cut, and then I swapped the feta cheese for swiss cheese. The Swiss cheese has a mild, sweet and nut-like flavor that is not over powering and tastes great with the spinach and steak. Plus it melts so smoothly inside the roll. Remove as much of the fat as you can from the meat. Be careful not to remove the meat. This takes some time but the end results is worth the extra time. Sprinkle salt and pepper on both sides of the steak. Layer the swiss cheese the entire length of the steak. Then layer the wilted spinach on top. Starting at the small end of the steak roll up the steak. Using tooth picks to keep the steak roll closed. Pre-heat oven to 375˚ F. Place in a baking dish. Wrap with foil and place in oven and cook 45 minutes or until the desired temperature as been reached. Note: Adding a sprinkle of fresh parsley on top before you cook really helps give it that little extra something. But then again something this yummy really doesn’t need it. There is this restaurant that we like going to from time to time that used to serve this veggie beef soup. It was so good! One bite, and I was hooked. The last time we went, I ordered my soup as normal only to be served simply veggie soup, so I asked what happened. I was informed that they never served veggie beef soup. I know that they did, I had it many times before. Instead of arguing with the manager I just said okay and moved on. But this got me thinking about how hard would it be to make veggie beef soup. I started looking at recipe after recipe. No two were the same. The basics were about the same, veggies and beef but nothing else. 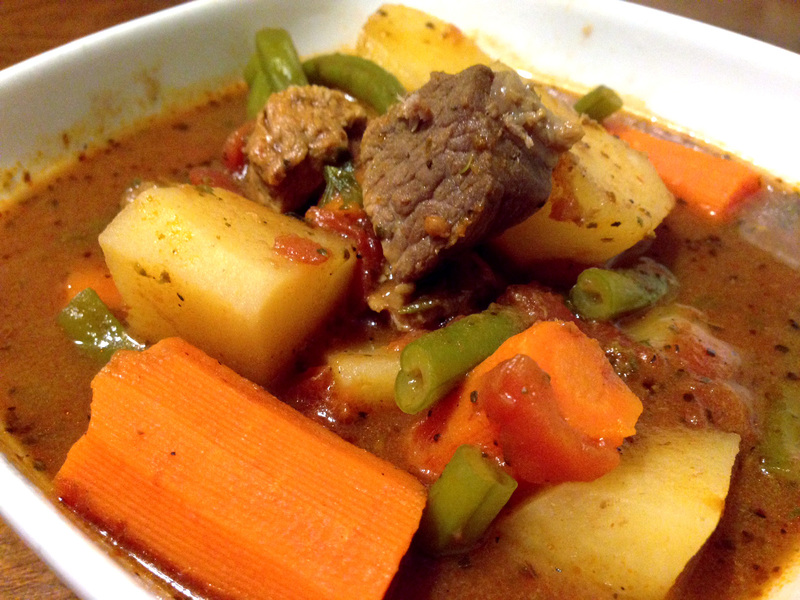 So I combines several different recipes with the parts that I liked and threw everything into my slow cooker and walked away. Tip: Make sure to have big chunks of the veggies. Having small sizes can cause the carrots and potatoes turn into mush. And you don’t want to eat mush for soup. Put everything into the slow cooker. Make sure to add the salt and pepper this will help bring the flavors together. Adjust the salt and pepper if needed. On low for 8-10 hours or high 6-8 hours. I prefer high temp, I think it gets the meat more tender then the low setting. But that is really up to you. Tip: You can substitute the tomatoes, paste, and Italian seasoning for 1 16oz jar of pasta sauce. This will work but you won’t have that fresh from the garden taste. See another easy meal to have ready for you when you walk through the door after a long day at work. You don’t need to spend hours in the kitchen to have a hot meal ready these days just need to learn to make what you have work for you not against. I have never been one to pass up chocolate, expect if it has nuts in it. I hate nuts and waiting for the brownies to come out of the oven. And how do you make an already yummy treat even better? Add more chocolate. 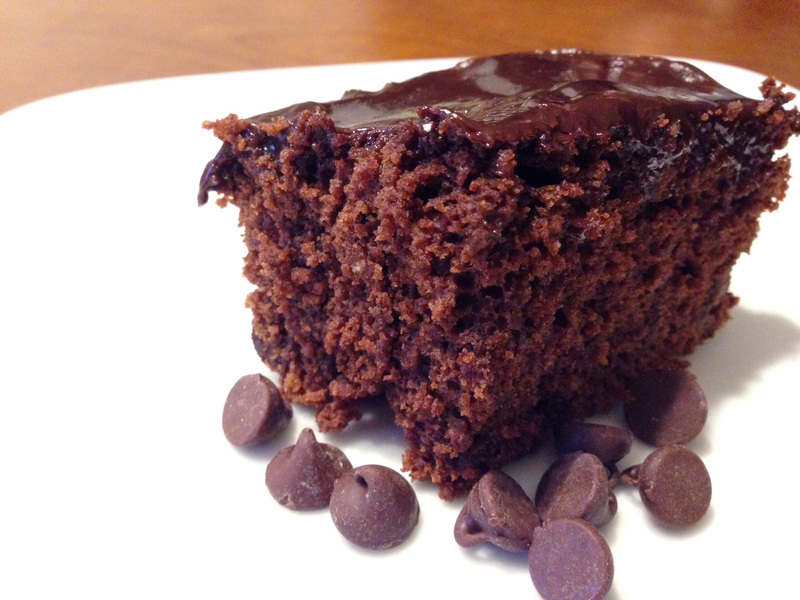 Chocolate chips and a silky smooth mocha glaze. YUMMY!! I blame my sweet tooth on my parents. I can ‘sneaking’ into my dad’s top dresser draw and taking his chocolate cover cherries during the holiday’s. But I would never open the box first, I waited until it was open. Or getting that chocolate bar when I went food shopping with mom. I think I have a chocolate problem. I wonder if they have a support group for chocolate lovers? 1. Heat oven to 350°F. Grease 13x9x2-inch baking pan or two 8-inch square baking pans. 3. Bake 35 to 40 minutes for rectangular pan, 30 to 35 minutes for square pans or until brownies begin to pull away from sides of pan. Cool completely in pan on wire rack. Garnish with chocolate chips, if desired. Cut into squares. Makes about 24 brownies. In a small sauce pan stir all ingredients together over low heat until well combined.